Have you always wanted long, lean, sculpted and toned muscles without all the bulk? This program is just what you need to gain strength, and get the benefits that weightlifting has on boosting your metabolism, without putting on unwanted muscle weight. Incorporating dumbbell exercises into your workout routine helps increase your Calorie burn for that desired slim, but strong figure. This intense level program is best done if you are already regularly exercising or if you just finished the Strong & Slim 2 program. You will need a set of both moderate and heavy weight dumbbells, a kettlebell if you have one (but is not essential), a bench and box or step. 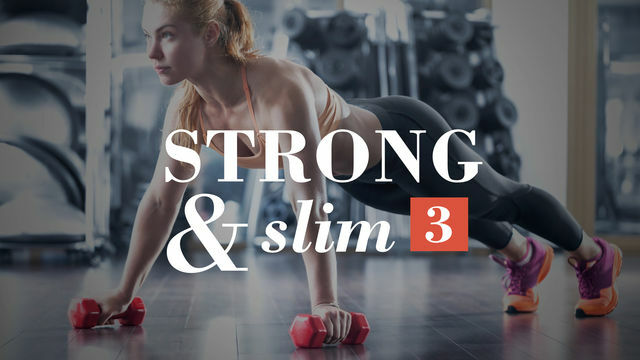 Blast through your fitness goals and get Strong & Slim starting today!